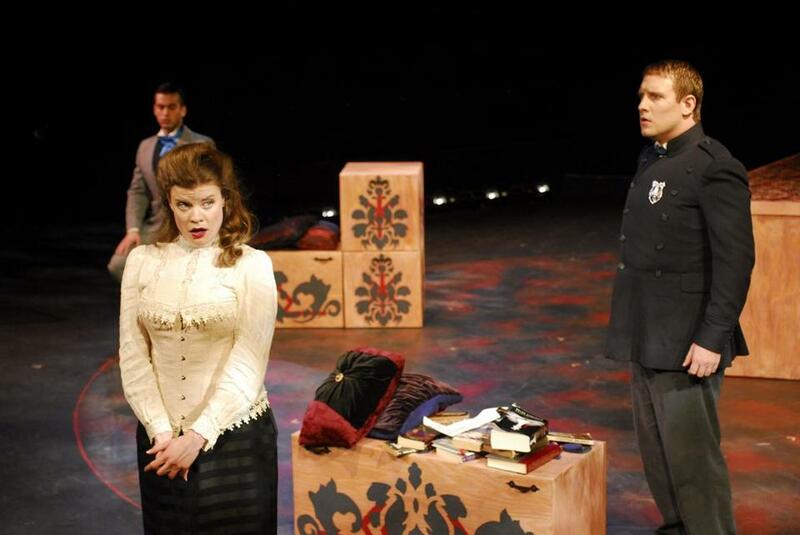 OperaHub’s stellar production of “Der Vampyr” stands out as one of the most rewarding theatrical events of the season. The company’s heady brew of Heinrich Marschner’s lush, Romantic score, combined with a libretto updated with the insouciant humor of Boston playwright John J. King, and a cast that performs arias and chorus numbers with rich musical tone and solid acting chops, makes this rarely performed opera wonderfully accessible and enjoyable to opera lovers and “Buffy the Vampire Slayer” and “Twilight” fans alike. And that is the beauty of this piece. Without sacrificing the melodic complexities of Marschner’s 1828 score, OperaHub uses an orchestral reduction for just six instruments and a libretto that taps into contemporary conversations about women cast as victims while nodding to our fascination with vampires. Under the crisp direction of Lina Marcela Gonzalez, in the intimate Plaza Theatre at the Boston Center for the Arts, the musicians deliver a sound that allows for distinctions between instruments, especially the horn and oboe, without ever overwhelming the singers. In the duets, trios, and chorales the individual voices manage to be distinct and then blend for a truly sumptuous effect. “Der Vampyr” is based on the short 1819 novel by John Polidori, considered the first vampire novel, and features Lord Ruthven’s quest for immortality. In King’s updated libretto, Lord Ruthven has been changed to Nedward Barnabas Collins, a delicious nod to both the vampire of the “Twilight” saga and the protagonist of “Dark Shadows.” Act 1 opens in Vital Fluids, a gin mill in London where Aro, the vampire coven-master (Jacob Scharfman), demands that Collins (a stunning Jacob Cooper) bring him 29 young women brides — one for every day before the next full moon — in order to achieve immortality. fiancée, and Muffy, a feisty maid at Carfax Abbey, who is assisted by Giles (Andrew Sokol), Carfax’s head butler. Both Tamara Ryan, as the independent-minded Della, and Lindsay Conrad, as the formidable “Vampire Naysayer,” offer breathtakingly solid sopranos that soar and trill without ever becoming shrill or thin. Both develop three-dimensional characters, each with a wildly different approach to defying conventions. But King’s libretto is the crowning achievement of this “Der Vampyr.” Not only is his rhyming dexterity hilarious (“I’ll seduce her, then I’ll juice her”), but it always serves the story and the score. OperaHub’s “Der Vampyr” is enjoyable on so many levels. The performance I saw included pre-teen audience members and an opera lover who said he was heading home to listen to his recording of the opera. Now that’s accessible. Correction: Because of a reporting error, an earlier version misidentified the character of Jonathan Parker, and the actor who played him.